Metallux AG: The demands on Metallux resistors are for intelligent distribution grid stadions high. They excel with an extremely high (long term-) stability. Despite many influences like temperature changes and voltage fluctuations the resistance value may not change. 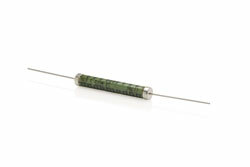 Metallux resistors of the series 968 are mechanically as well as electrically robust components. They are especially suited for applications under extreme environmental conditions. The voltage sensors are used in modern energy management. In the end the sensor detects the energy flow and manages the interactions of the available energy sources like power stations, windmills, photovoltaic equipment just to mention a few. The voltage sensors are an indispensable component for intelligent distribution grid stations within a modern energy management. Amongst others one finds them in so called local distribution stations. The Metallux-resistor, being the actual sensor element is encapsulated in the voltage sensor. This sensor is inserted into the back side of the T-connector. The transmission accuracy of the sensor will remain constant during its life cycle and must not be readjusted. Adjusting of the sensor to the required primary- and secondary voltage takes place in advance. The voltage sensor is suited for either original equipment as well as for retrofit equipment as no alterations for the distribution grid station is required. For the secondary energy distribution in the medium-voltage power grid of the future our voltage sensor is an indispensable part of intelligent distribution grid stations. All our power-and voltage sensors are being developed and certified according to norms IEC 60044-7-and (forthcoming IEC 61869-10 and-11.Voltage sensors are maintenance-free and are also suitable to operate under extreme temperature-and humidity conditions. Metallux High Voltage Resistors in various designs and shapes. The right decision for demanding and challenging usage. Continuous developments of thick-film technology innovations make it possible to apply resistors in different power ranges, shapes and high accuracy on various substrate materials. Applications are in measurement and test engineering, power- and high voltage technology, medical technology, electrostatic, automotive and traffic engineering. Metallux AG is a high-performance manufacturer of electronic components in thick-film technology. The Swabian high-tech company has a broad spectrum of services and besides its standard range of pressure, position, angle and membrane sensors, high-voltage and power resistors, it also offers customer-specific complete solutions through to the packaging of potentiometers and joysticks. An established customer orientation provides suitable ideas and solutions for satisfied customers. Innovative products, a variety of patents and many years of experience - numerous well-known customers from the automotive, electrostatics, medical and industrial electronics and sensor technology industries have been served for over 29 years by the head office situated since November 2011 in Leutenbach-Nellmersbach near Stuttgart, Germany.